This MAb is specific to ER alpha and shows minimal cross-reaction with other members of the family. MCF-7 Cells or Breast Cancers. This MAb is specific to ER alpha and shows minimal cross-reaction with other members of the family. ER is an important regulator of growth and differentiation in the mammary gland. Presence of ER in breast tumors indicates an increased likelihood of response to anti-estrogen (e.g. tamoxifen) therapy. 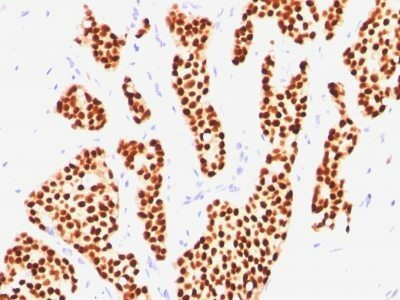 This MAb is excellent for staining of formalin-fixed, paraffin-embedded breast carcinomas. 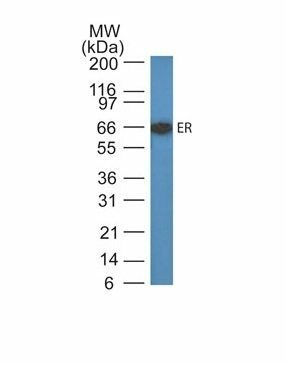 Catalog number key for antibody number 0505, Anti-Estrogen Receptor (ER505) The prefix indicates conjugation, followed by the antibody number and size suffix.